GLOSSette here!!! If you watch my beauty channel I’ve shown my pink makeup train case in my Christmas Haul and my Vanity Tour. When my friend, bf at the time, bought it for me it came with few samples. 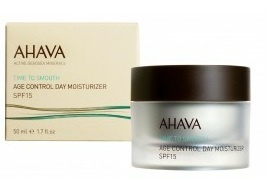 One I really liked was this AHAVA moisturizer. I didn’t think of anything at first since I never heard of the brand and it is for aging skin. I am 25 so not using anti-aging products yet. There are mixed opinions out there as to when you should start using such product. For me I would say around 30. Back to the product at hand… I ended up loving it a lot. I’m not video reviewing it since it’s just a very small 3ml size package that I got which you would’ve seen a sneak peek of if you saw my recent How to Organize Your Jewelry video. I wanna share with you a bit about the brand since they do have a unique concept. “The Dead Sea is our home at the bottom of the world. In 1988, we began clinical research into the powerful effects of its rich selection of minerals in facilitating skin renewal, forming AHAVA Dead Sea Laboratories.” I don’t know how much of this “natural” good stuff they put in their products but it just sounds good nonetheless. The moisturizer is pretty thick for a day cream. I used it in the winter when I was having issues of dry patches, which I never had issues with EVER. Btw, I have oily skin if you don’t already know. It works quite nicely. If it was the hotter months I probably would have to use it at night BUT I can’t since there is SPF in it. For a day moisturizer it is nice that it comes with some SPF. The scent was pretty mild. I had no irritations or breakouts. It claims to diminish lines and wrinkles, seal in moisture and protects your skin against the sun’s damage. I can’t say for sure if these claims were true since, once again, I don’t have aging skin. It is quite moisturizing though. OH and I just read also on the package that it is paraben free. It comes in a 50ml jar for $58 USD. Looks like a very high end product and for a high end price. You know me, it’s not my cup of tea (oh hey its rhymes lol). I know of other good anti-aging products from the drugstore for a very good price and good quality too. My conlcusion is if you want a simple day moisturizer, in a nice looking jar and a high price tag, that has SPF and can possibly deal with your aging issues… this is the product for you. This entry was posted in A - F, Ahava, Brands, Makeup & Skincare, Reviews and tagged 15, age, aging, ahava, anti, anti-aging, control, day, dead, dead sea, dry, end, face, high, high end, laboratories, Makeup & Skincare, moisturizer, moisturizing, nay, oily, or, review, reviews, sample, sea, skin, skincare, smooth, spf, spf 15, sunscreen, time, time to smooth age control moisturizer, to, yay, yay or nay. Bookmark the permalink.